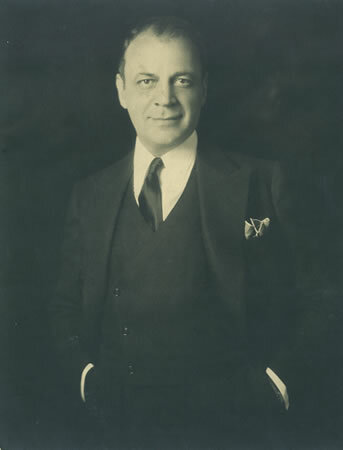 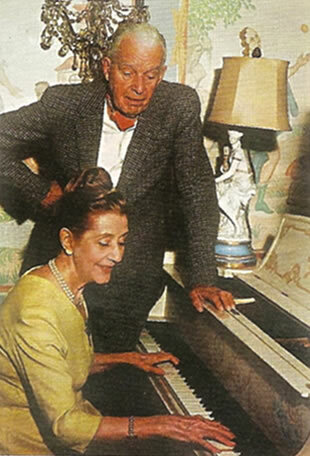 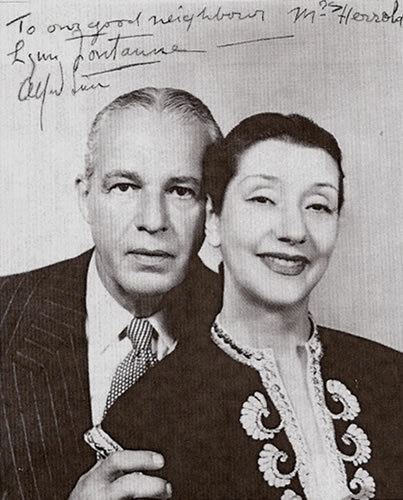 Claggett Wilson was "a dear friend" of the famed Broadway acting team, Alfred Lunt and Lynne Fontanne. 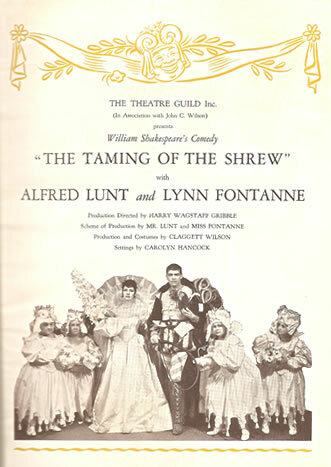 He designed the set and costumes for "The Taming of the Shrew" in which the Lunts appeared. 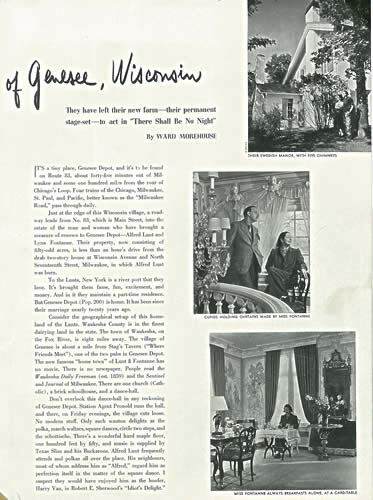 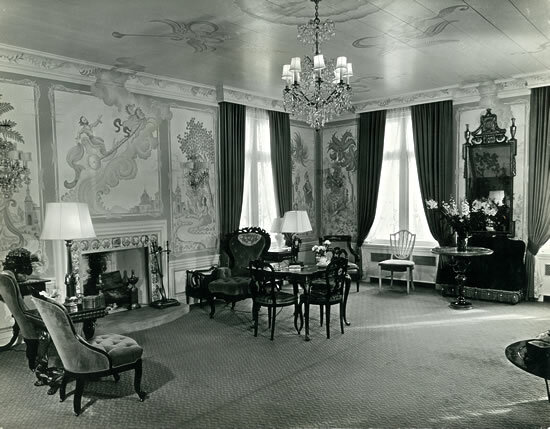 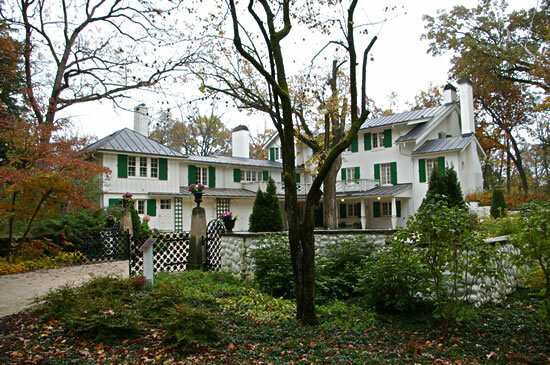 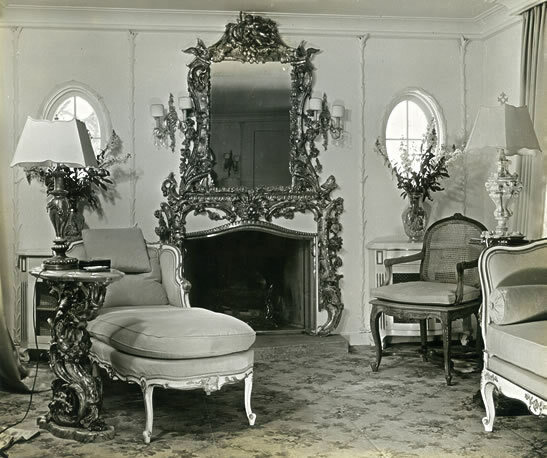 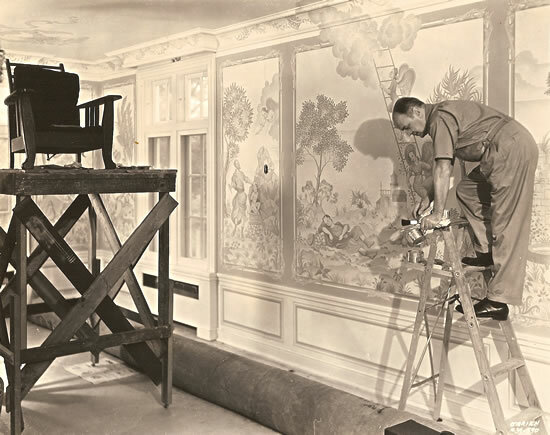 Ten Chimneys, the Lunt's Wisconsin home, became the backdrop for Mr. Wilson's considerable talents as a decorator and muralist. 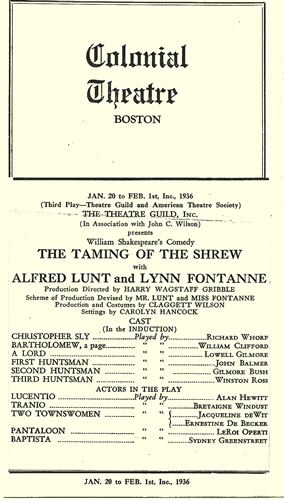 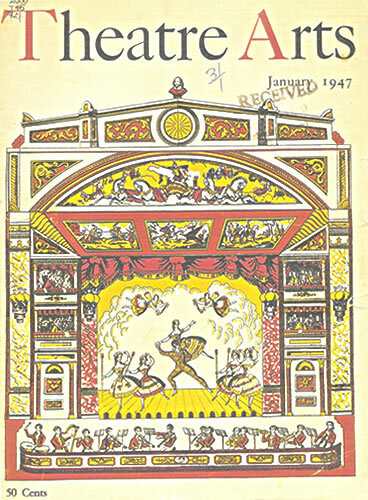 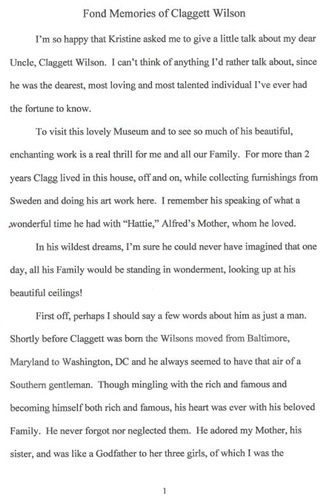 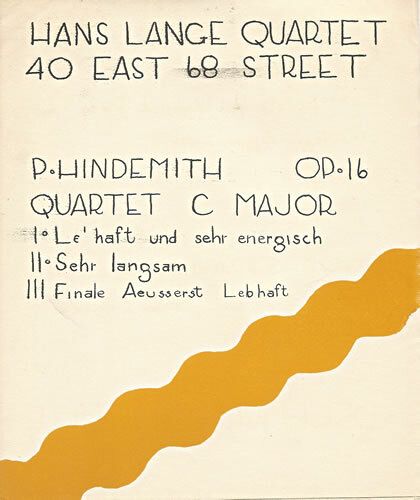 1958, Claggett Wilson Read went back stage and met the Lunts. 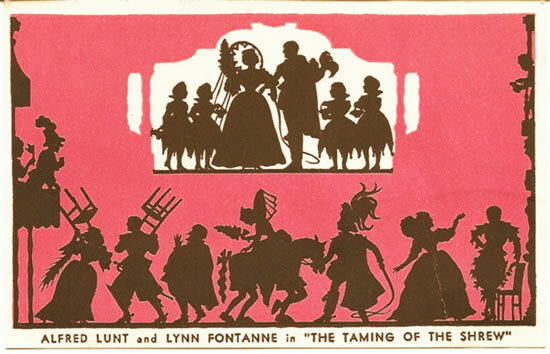 The Visit was their final Broadway stage performance. 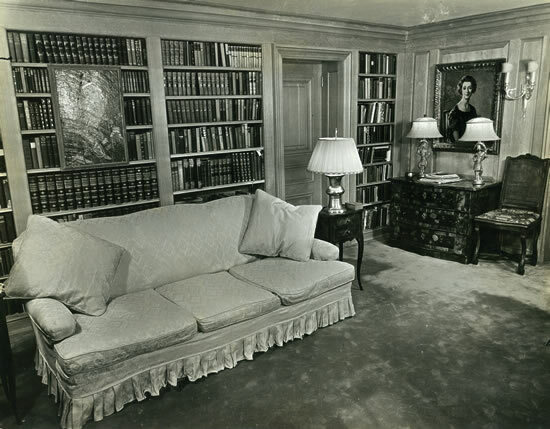 The Lunt's New York City apartment. 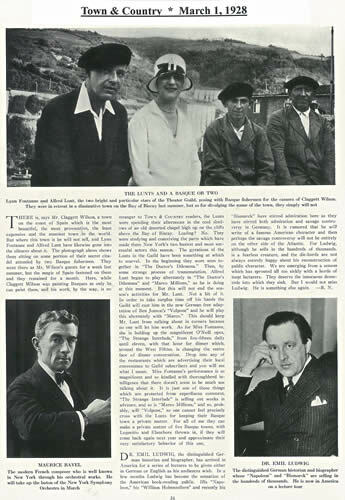 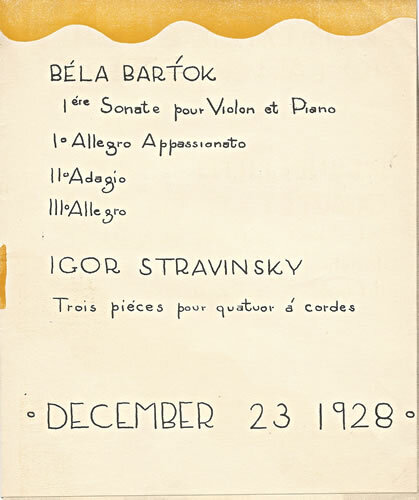 Town & Country article, November, 1937. 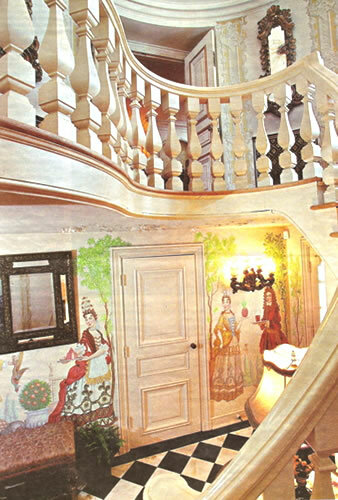 Mural detail in the entrance hall. 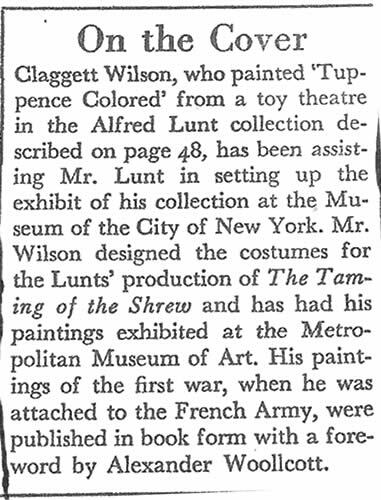 and executed by Lunt family members. 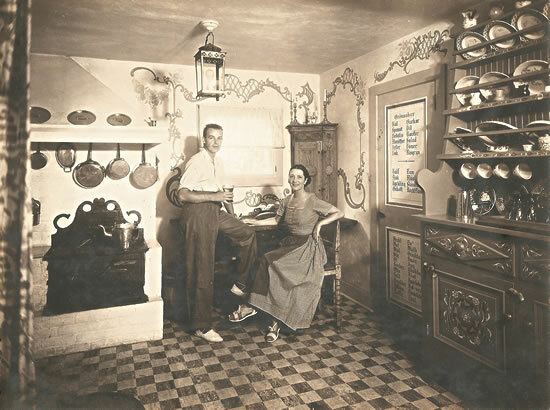 Alfred and Lynn in the kitchen at "The Hen House", formerly known as "The Honeymoon Cottage", where they lived as newly weds. 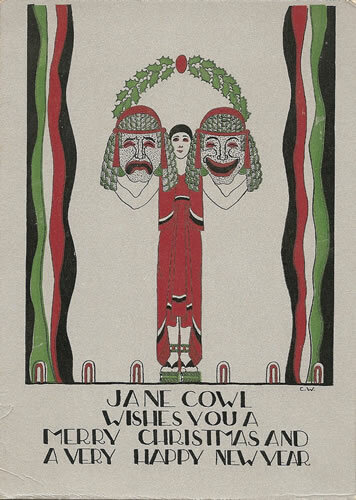 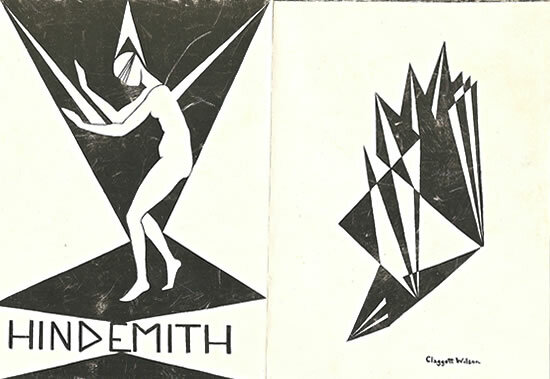 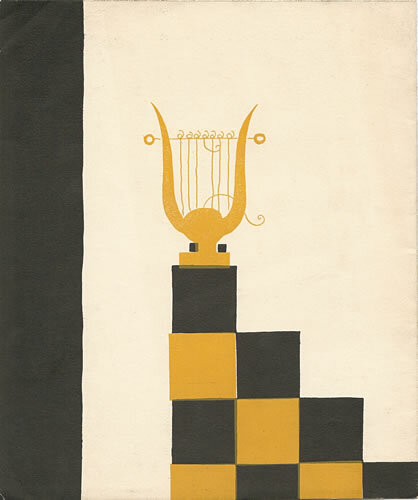 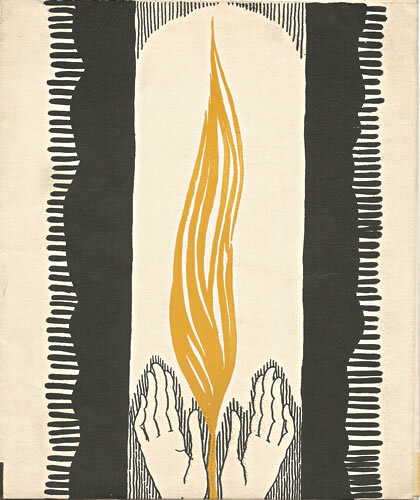 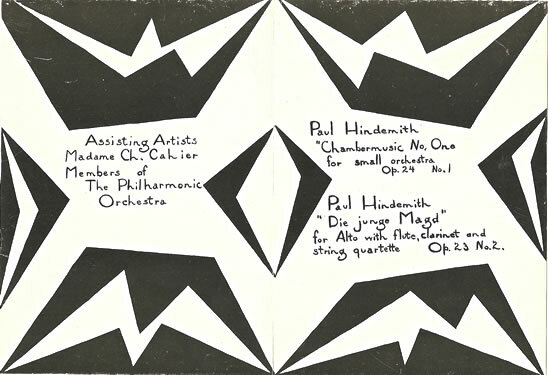 Design and decoration by Claggett Wilson. 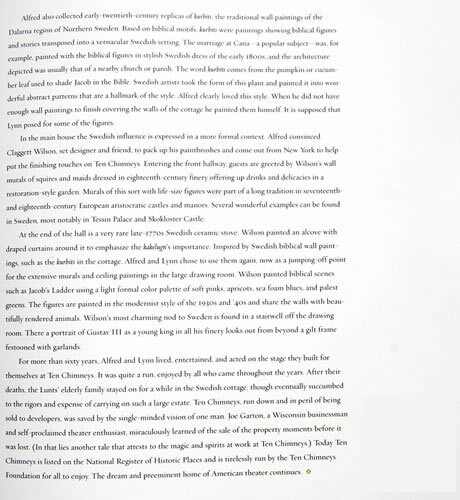 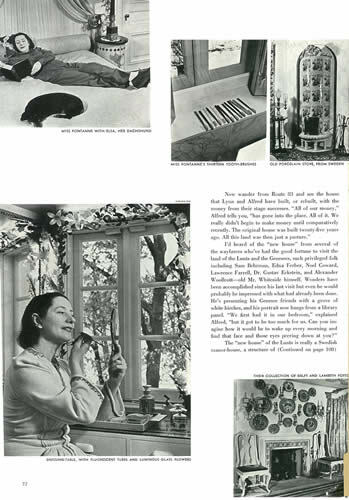 "...It was Claggett Wilson who furnished the entire kitchen...utensils and all." 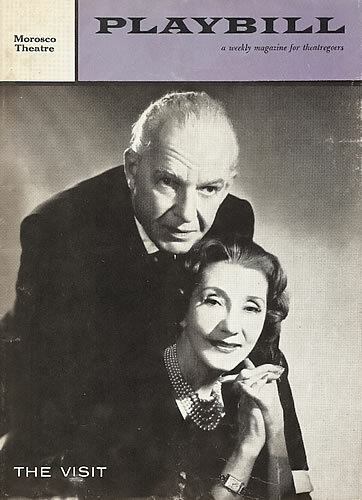 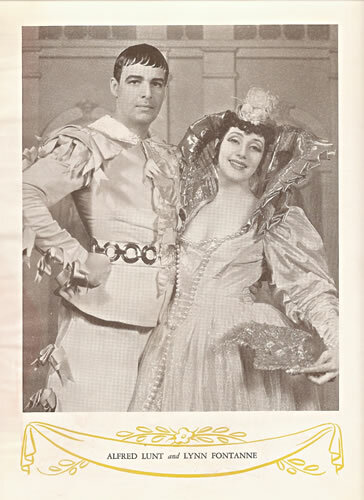 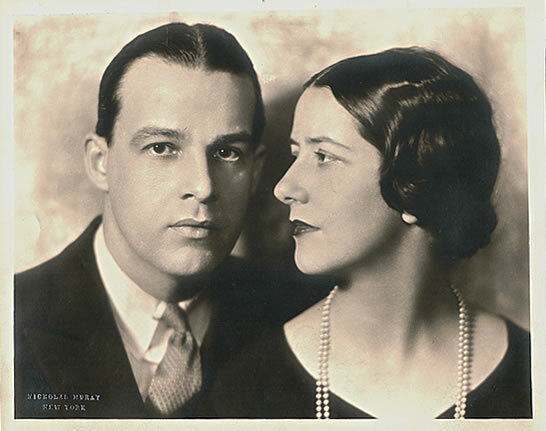 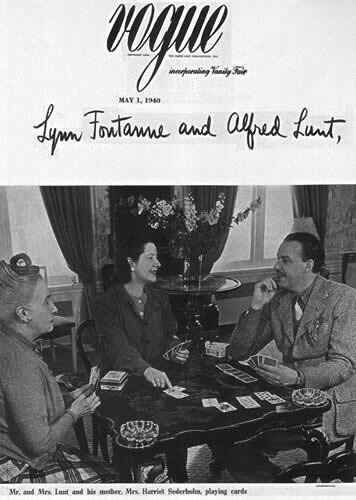 (Reminiscences of Alfred Lunt & Lynn Fontanne by Carolyn Every, the Lunt's cook). 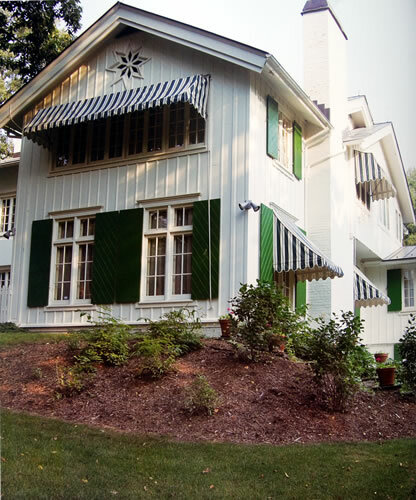 Green-shuttered Ten Chimneys, as viewed from the side, has traditional Swedish board and batton siding. 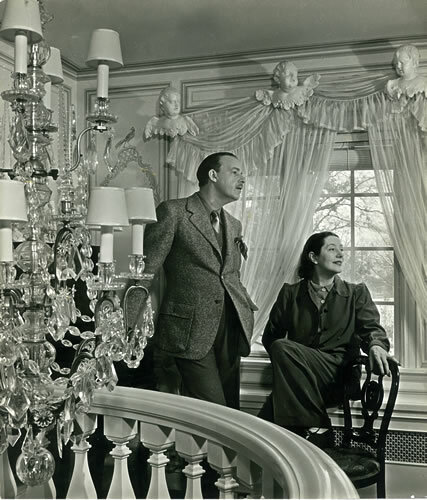 Alfred installed the eight-sided star window. 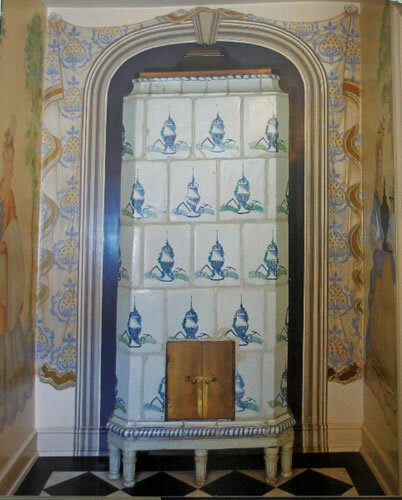 A rare eighteenth-century Swedish kakelugn stands at the end of the front hallway. 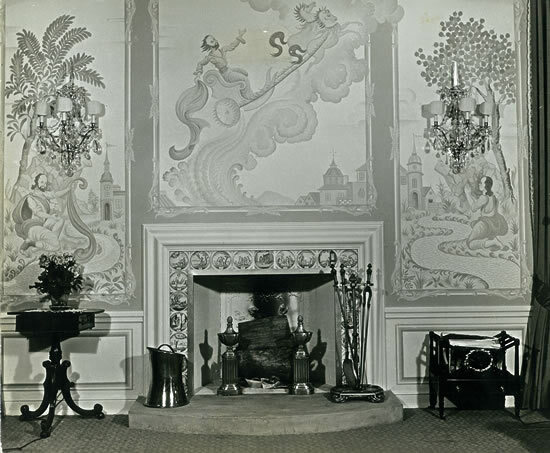 A trompel'oeil proscenium with drapery frames the stove. 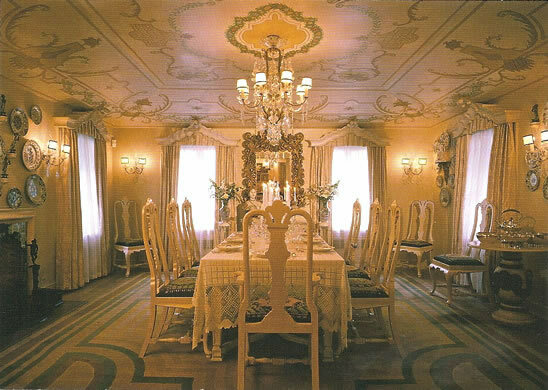 Kakelugns can be tricky to install properly and usually an expert from Sweden needs to be sent in when reconstructing an authentic one. 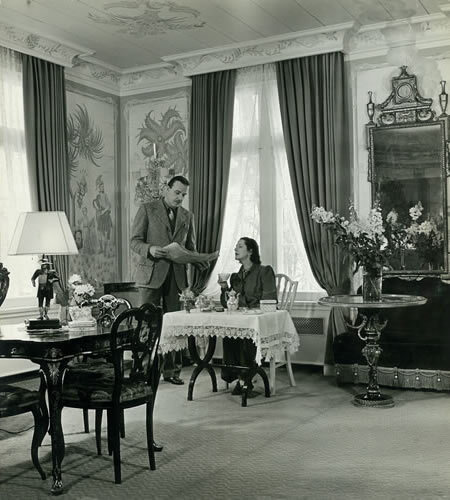 Alfred and Lynn loved to rehearse for their latest play in the "flirtation room" because of its many doors. 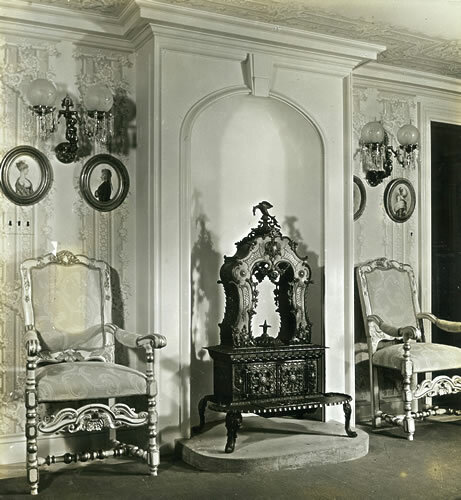 Note the Swedish tall case clock over-painted and embellished into a gilt confection, complete with grisaille French chickens and pastoral scene. 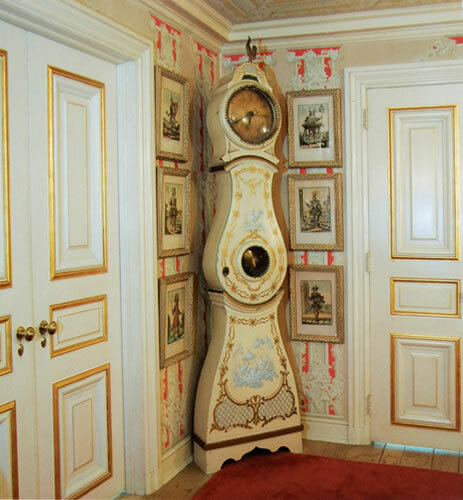 The rooster on the top of the clock is made of brass. 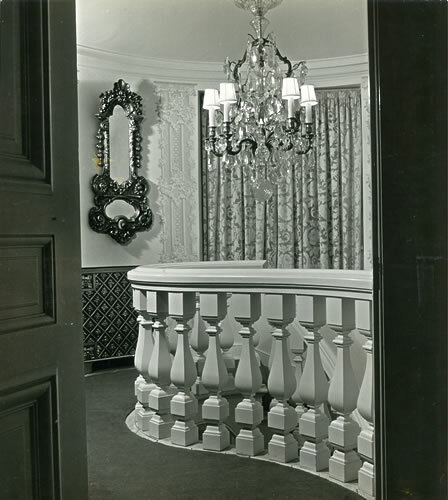 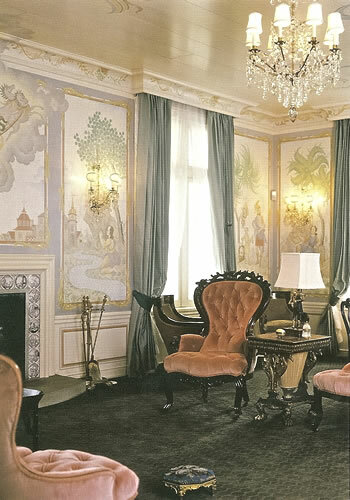 From the "flirtation room" you have a clear view of the bedroom hallway and stairwell, complete with Claggett Wilson's portrait of Gustav III. 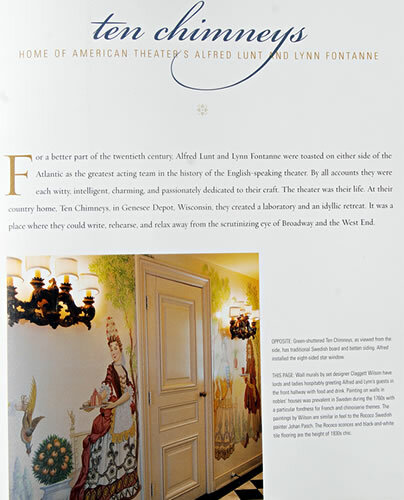 The wall treatment is decoupage that Alfred and Lynn cut out and pasted there. 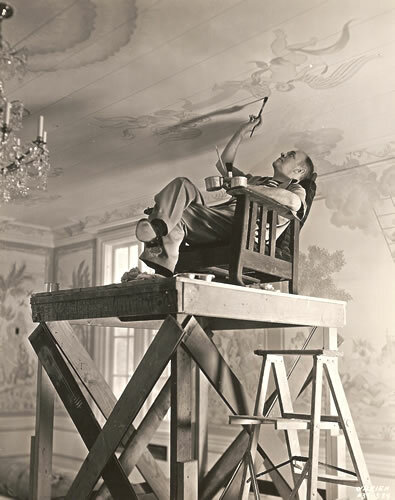 Alfred and Lynn had Claggett Wilson paint biblical scenes on the walls and ceiling of the great drawing room derived from paintings in Swedish manor houses and castles of the 1740s to 1780s. 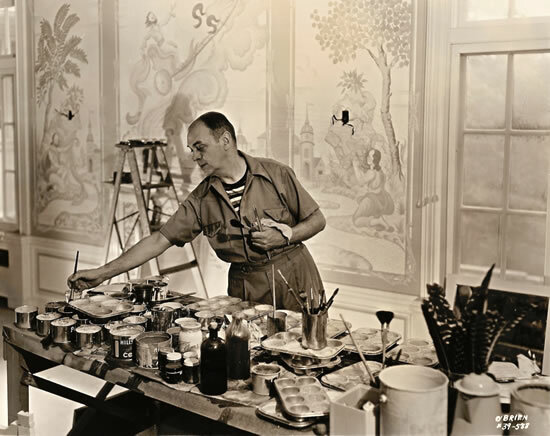 The paintings by Wilson are done in soft shades of apricot, pale yellow, and sea foam greens and blues. 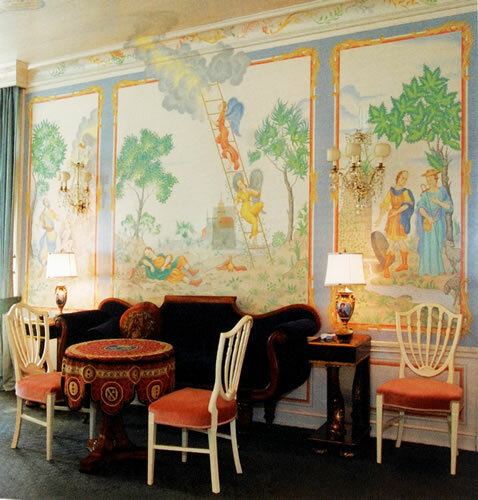 A depiction of Jacob's Ladder is the focal point of the wall in the drawing room. 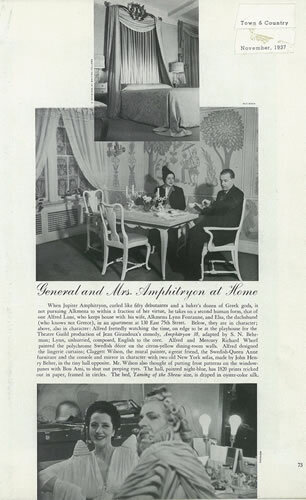 Alfred, a gourmet cook, would indulge his love of all things culinary in the spacious kitchen. 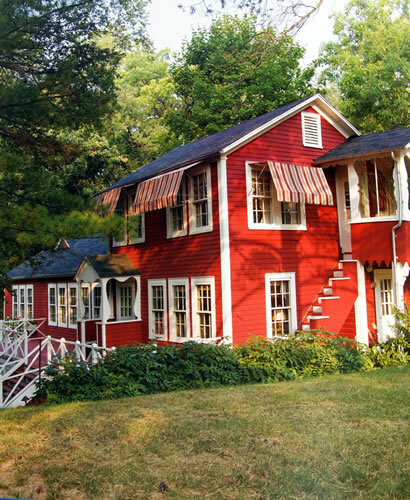 He reveled in growing his own vegetables and berries and kept a creamery on the property. 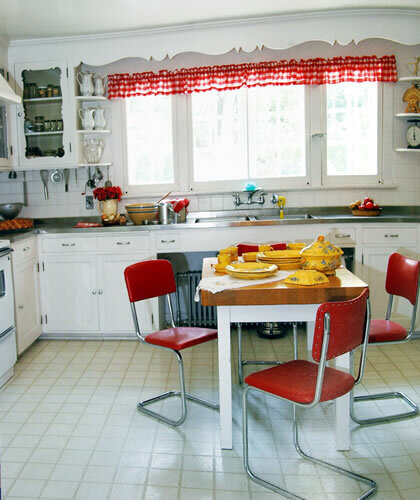 The red-checked curtain and charming scallop-edged wood valance lend the kitchen a Swedish air. 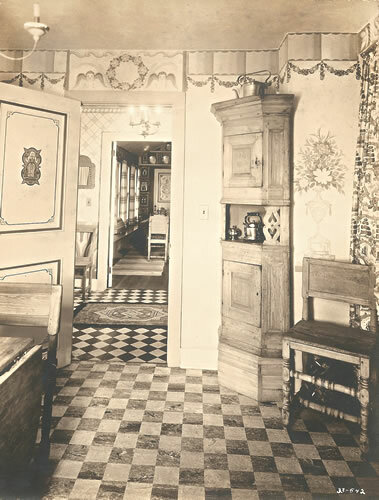 The cottage was known affectionately as "the Hen House" because it had once been the chicken coop and later was where Alfred's mother stayed. 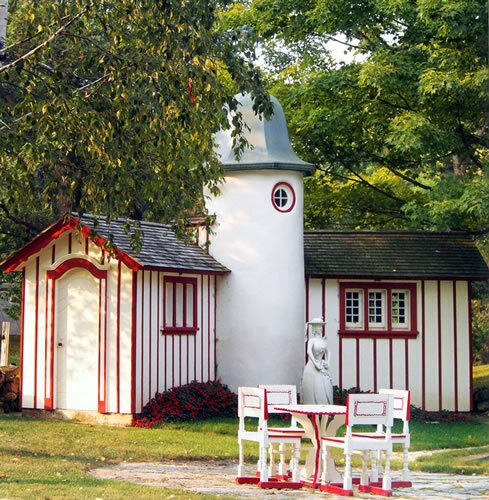 Painted red with crisp white trim, the cottage is the very vision of the Swedish countryside with the addition of some stylish 1930s-style red-and-white-striped awnings. 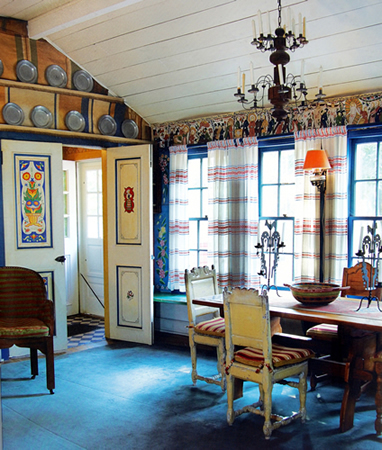 The kitchen in the cottage has theatrical borders painted on the walls as if to emphasize the stage-set quality of a Swedish stuga transposed to twentieth-century Wisconsin. 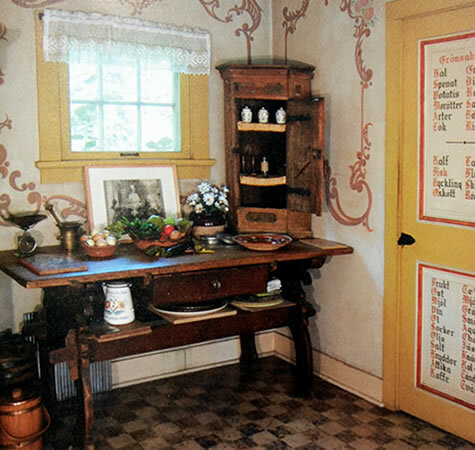 A seventeenth-century Swedish hanging cupboard sits on a rare red-painted Baroque Swedish double trestle table. 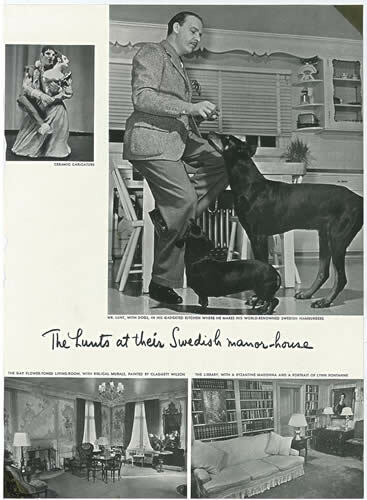 The lettering on the door is Alfred's grocery list in Swedish. 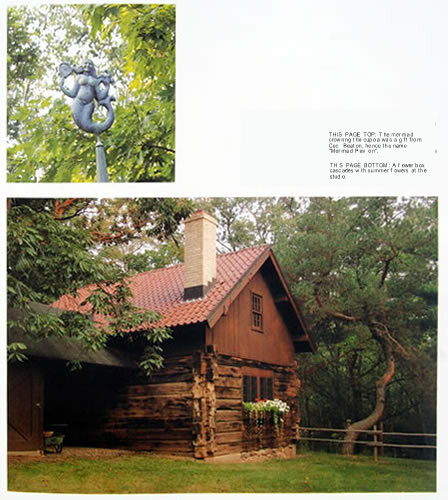 The word fisk is painted in red...speculation on this abounds. 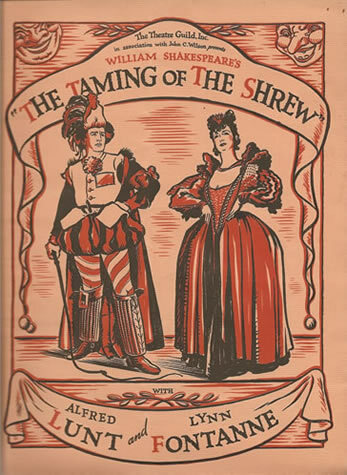 Is it Alfred's red herring? 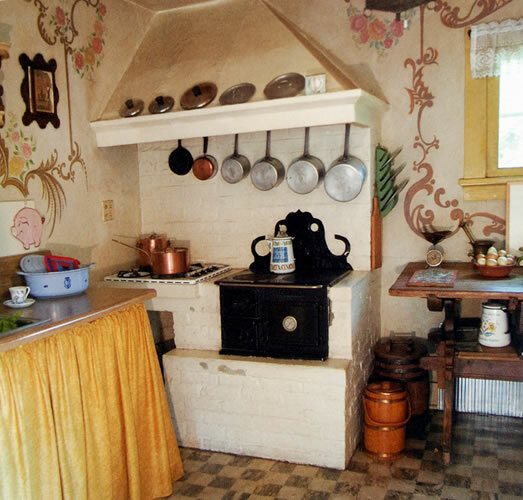 The corner stove has a charming faux backsplash in black. 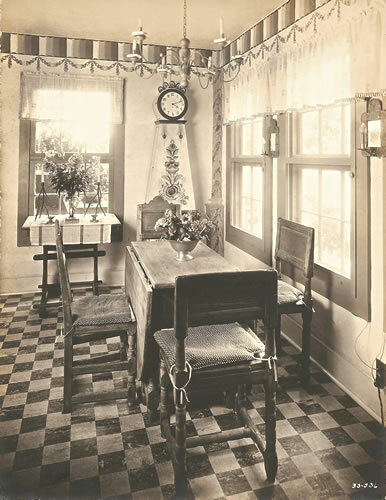 A traditional nineteenth-century wood-and-wire chandelier hangs over the breakfast table in the kitchen. 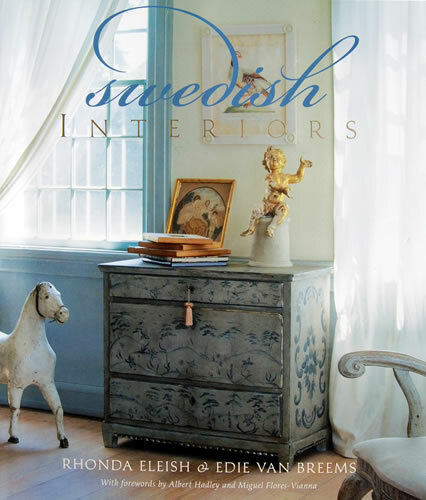 Cushions add comfort to antique Swedish pine farm chairs. 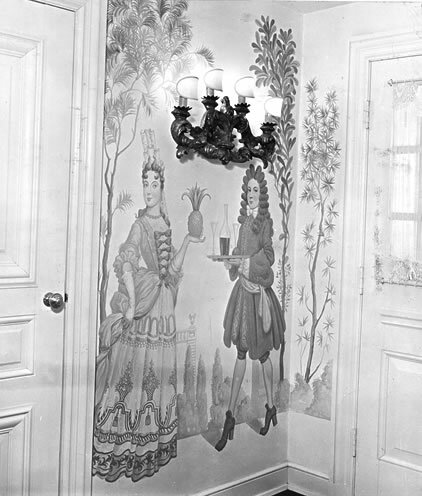 The stencil border around the kitchen was painted by Alfred, who left all of the pencil marks from the outlines, as is done on stage scenery. 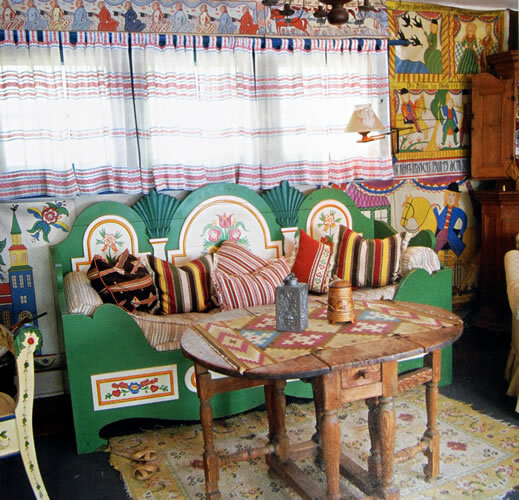 An eighteenth-century Swedish gate leg table sits in front of a bed decoratively painted by a Swedish-American artisan from the early part of the twentieth century. 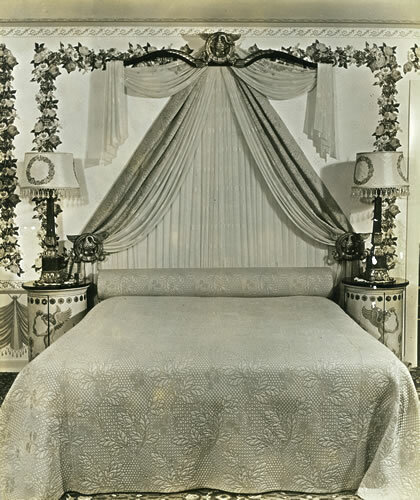 A beautifully made bed, resplendent with linens, was a sign of prestige in peasant homes. 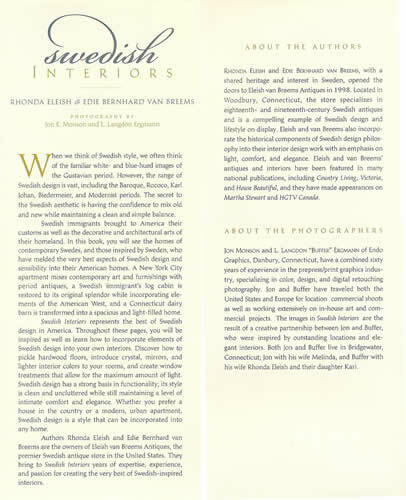 Light streams through the living room windows of the cottage, which are softly curtained by Swedish textiles. 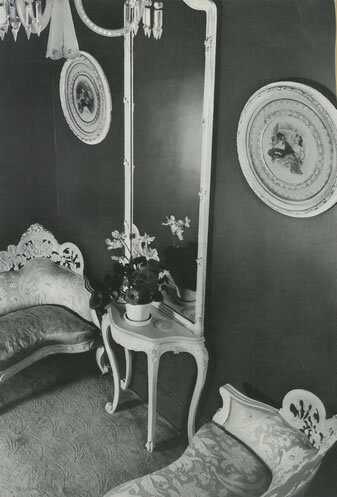 All manner of built-in cabinetry was used in stugas. 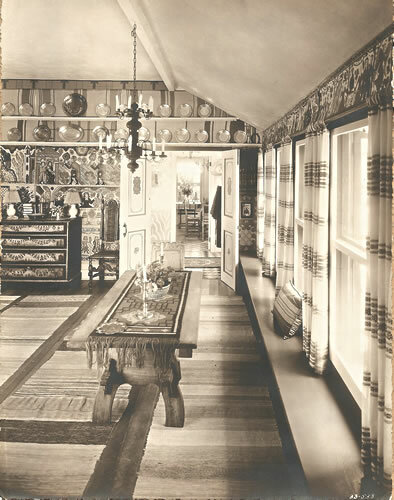 Typically, a long built-in bench was installed to provide seating and storage along the wall facing the kitchen table. 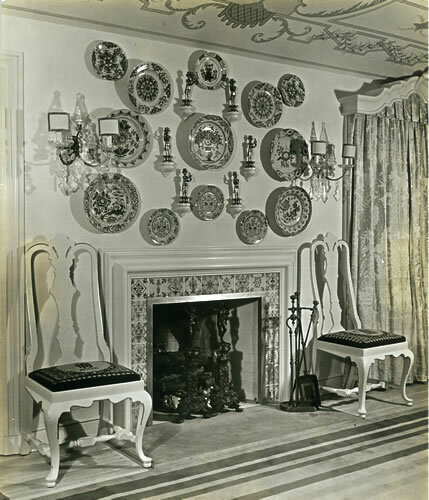 Early nineteenth-century iron candlesticks flank a wooden bowl on the table. 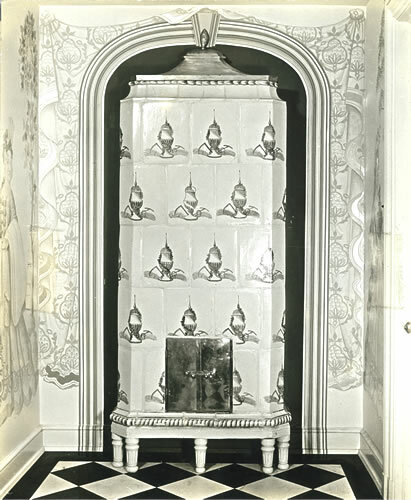 This kind of candlestick derives from medieval Swedish smith work. 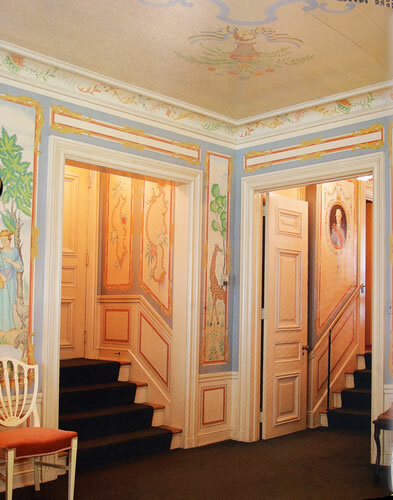 The wall of the cottage living room is papered with turn-of-the-century wall paintings in the style of Sunnerbo, Sweden. 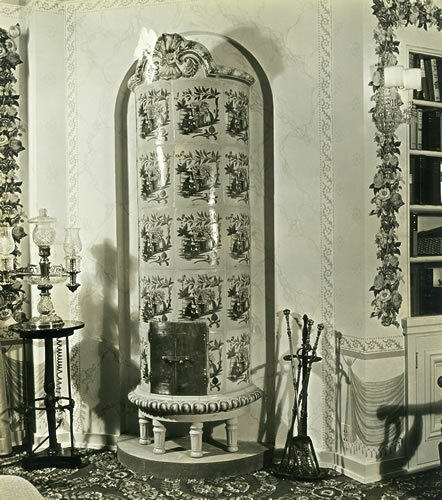 Around 1875 paper became widely available and instead of painting on canvas the Sunnerbo artisans were able to produce decorative hangings in mass. 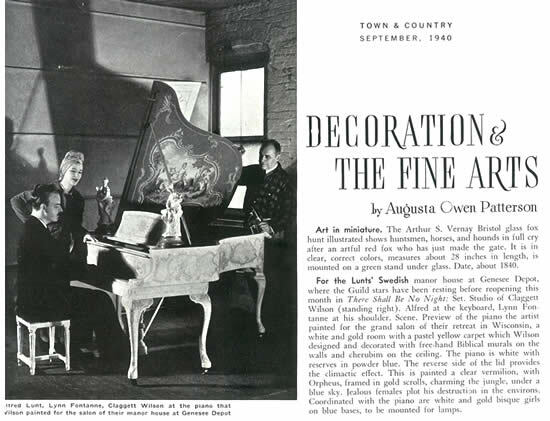 These appear to have been bought by Alfred on his travels. 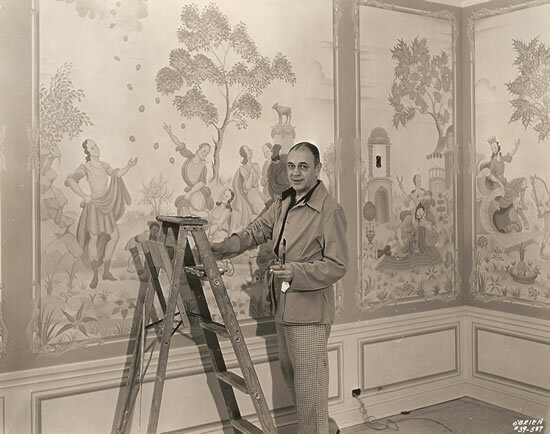 There were not enough hangings to finish the room so Alfred painted the rest himself. 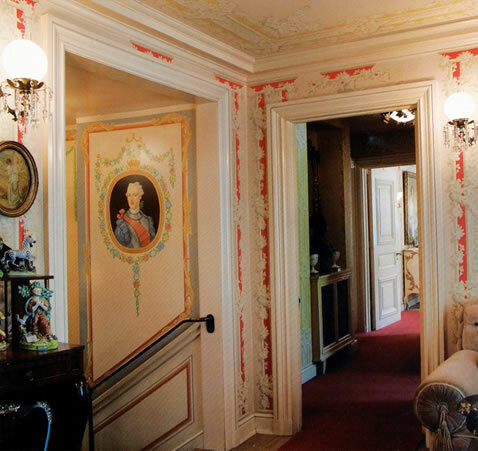 necessary warmth in the harsh Swedish climate. 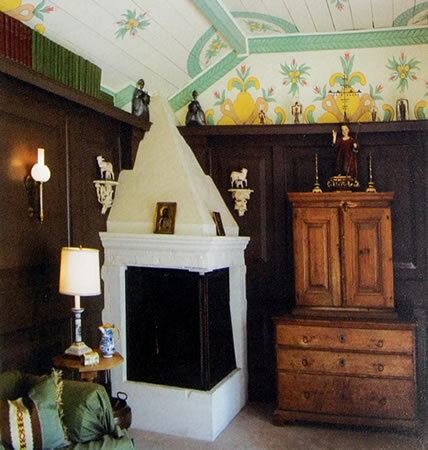 In the cottage's library, Alfred had a fireplace built in the traditional Swedish manner of the nineteenth century -- built into a corner and sticking out at a diagonal into the room. 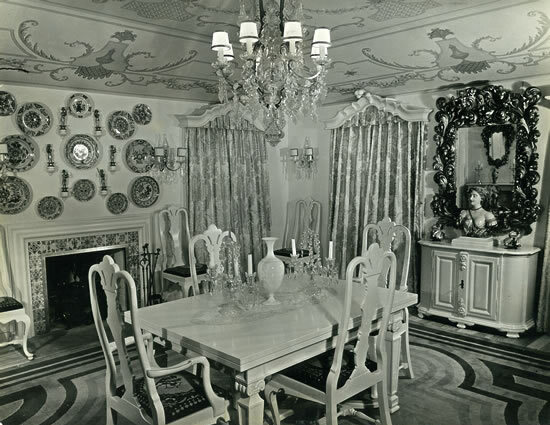 Stylized kurbits patterns adorn the ceiling. 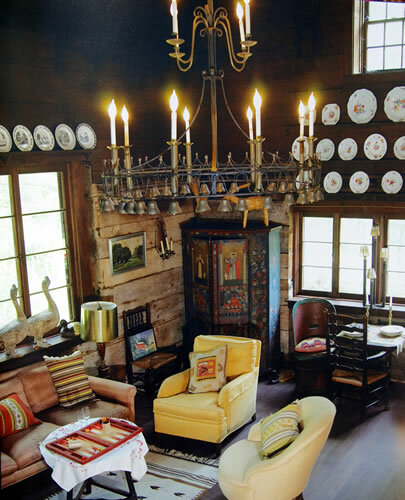 A grand metal chandelier ringed with bells hangs from the vaulted ceiling of the timber-framed studio. 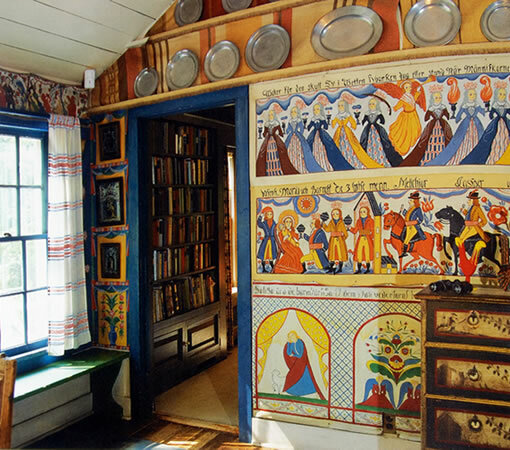 Plate racks line the walls as would be traditional in a stuga. 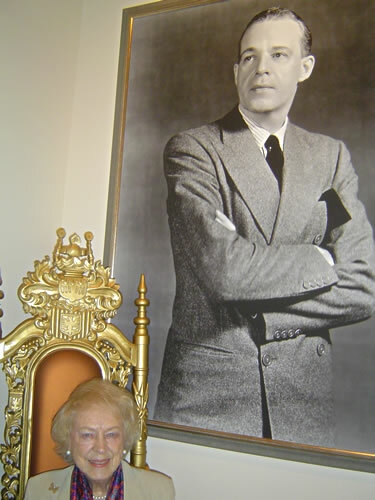 A rare pair of Norwegian barrel chairs sits by the window. 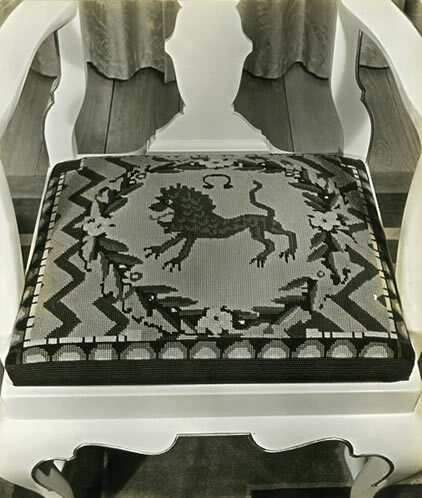 The pillows adorning the furniture are made of Swedish textiles. 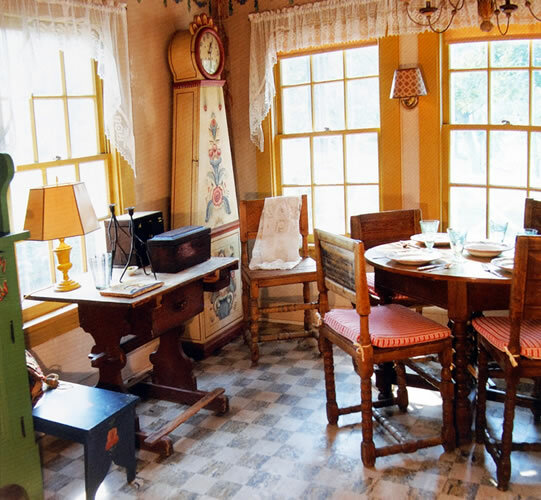 around a table for alfresco dining. 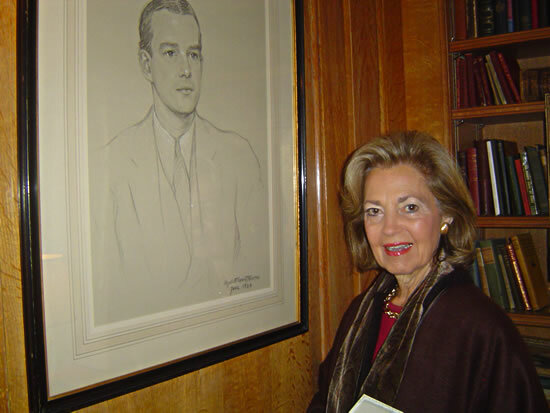 Diana Enright has lived in California for over forty years where she and her husband own Estate Mortgage Corporation. 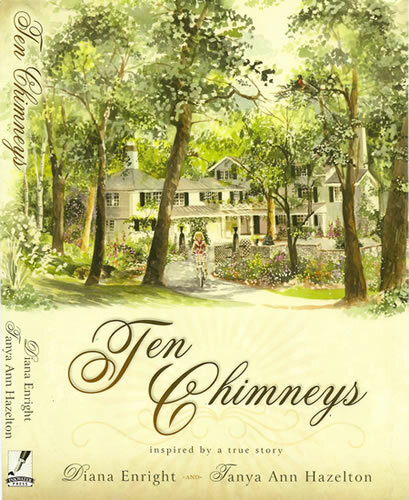 After retiring four years ago, Diana consumed herself in the writing of this labor of love. 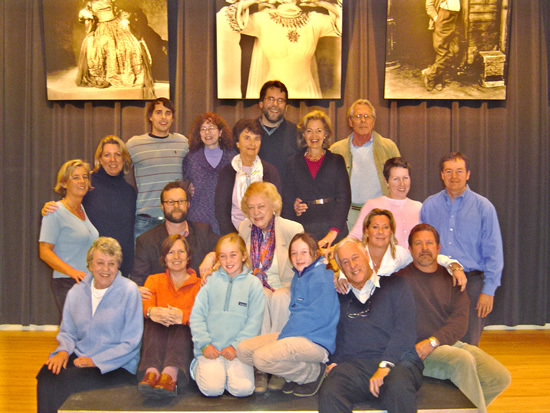 She will now focus on family, including five grandchildren, and dear friends. 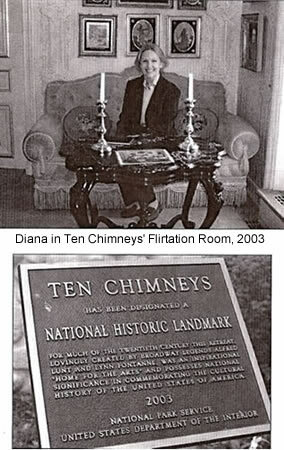 Diana will continue her yearly visits to Ten Chimneys. 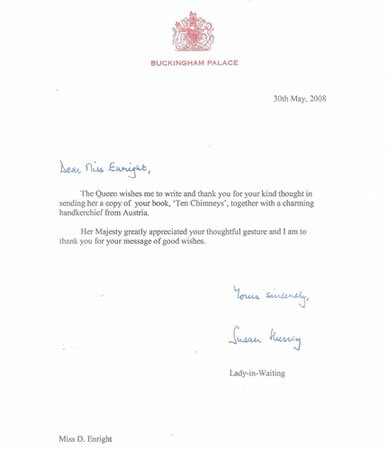 A thank you note from Buckingham Palace. 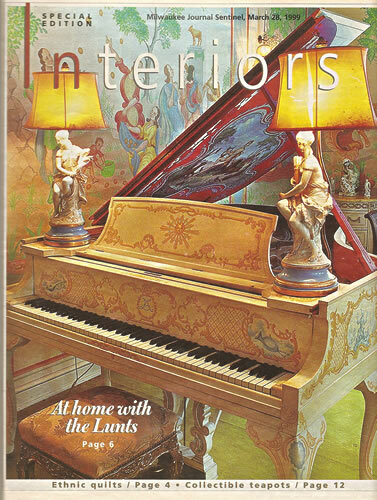 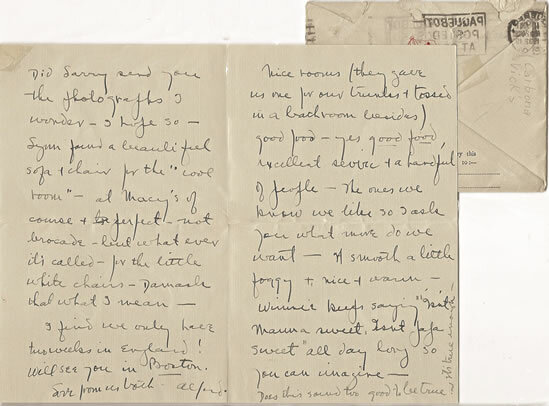 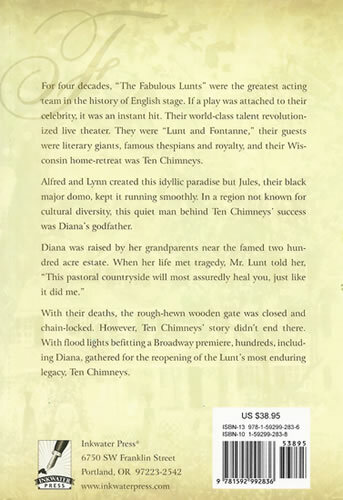 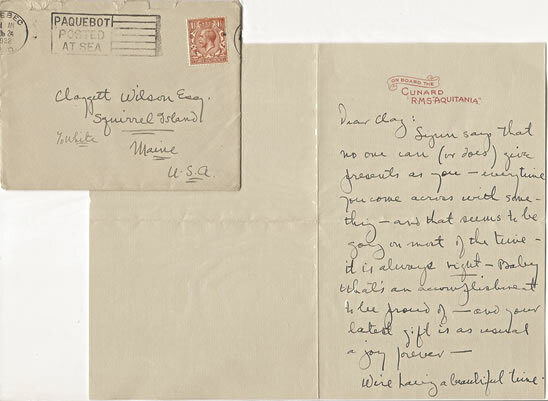 Queen Elizabeth's interest in a copy of the novel "Ten Chimneys" is linked to a request that Lynn Fontanne (A British subject) be posthumously honored with Knighthood for the contribution that she and Alfred Lunt made to the war effort while living and performing in England.